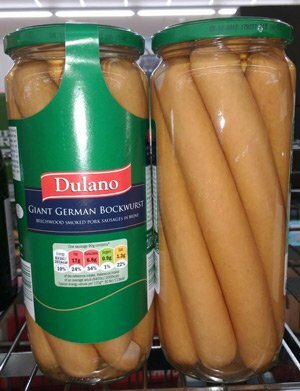 Whenever I think of a Bockwurst sausage I can't help thinking of beer, loads of it in large glasses sitting around a trestle table in a large marquee. And if you think the same then you'd be absolutely right. The "bock" element in the word Bockwurst comes from the dark malty German beer traditionally brewed in Bavaria but there's actaully no beer in the sausage - it's simply the sausage to eat when drinking bock beer. Both are made with a meat content of pork and veal although the ratio is different with bockwurst having a higher pork content. In addition both sausages start off with the classic German seasonings of salt, white pepper and mace / nutmeg but when it comes to the herbs, bratwurst contains sage whereas bockwurst goes more in the direction of onion and chive. Bockwurst is a much coarser grind of meat. You'll see the recipe below that I specify an 8mm plate whereas if you refer to my homemade bratwurst recipes then you'll see that a 5mm plate is used. 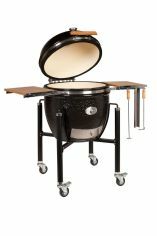 In addition, bratwurst can be made fresh or using a curing seasoning (which can then be smoked). The next difference between bockwurst and bratwurst is in the cooking method. Bratwurst is traditionally steamed (or poached) whereas bratwust is grilled (sometimes after poaching in beer) although both are traditionally served with a mild mustard. 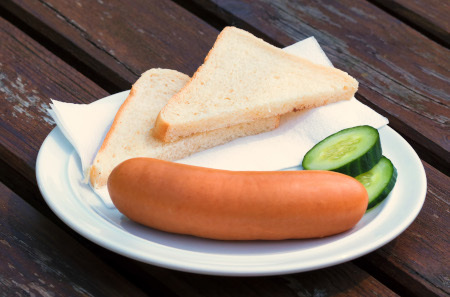 The last big difference between bockwurst and bratwurst is about 4,500 miles. Both have their origins in Bavaria but "the brat" has been taken to the hearts of Americans in Wisconsin (where many German immigrants settled) and in sports stadia nationwide. If we are splitting hairs then the bockwurst is also traditionally a slightly shorter link (5") that the bratwurst (6") but when it comes to a hand-linked homemade bockwurst sausage recipe we're not going to worry about an inch. Note: My homemade bockwurst sausage recipe calls for veal and this is tradition. Bockwurst can be made from chicken, if you choose to do this then use the thigh meat. You will need to prepare approximately 2m (7 feet) of hog casing. Read my section on making homemade sausage to see how this is done. Bockwurst sausage in the supermarket but we can do better! Dice up the meat into cubes and grind using an 8mm plate (approx), place the ground meat in a mixing bowl and return to the refrigerator. Using a pestle and mortar, grind up the celery seed and then mix with all the other seasoning ingredients to make a paste. Place this in the refrigerator for 30 minutes. Now mix the ground meat and seasoning together and give yourself a good workout, this mixing process needs to take at least 5 energetic minutes. Place the sausage meat into your stuffer, full your hog casings and make 5" links (approx). When finished, place your sausages in the refrigerator on a bed of paper towel and allow the seasonings to mingle overnight. The traditional method is to steam the sausage until the internal temperature reached 71°C (160°F) and then take them away from the steam and allow them to rest for 5 minutes before tucking in. Serve with a mild mustard.